Hello, Friends of the Dharmachakra Buddhist Center! Big news in March -- We’re Moving! *NOTE: THE CENTER WILL BE CLOSED FOR THE MOVE FRIDAY, MARCH 4 THROUGH TUESDAY MARCH 8 – WE’LL REOPEN FOR CLASSES WEDNESDAY, MARCH 9 AT THE NEW LOCATION. Our new space will include a larger meditation room to accommodate more students as well as an expanded bookstore and community room. 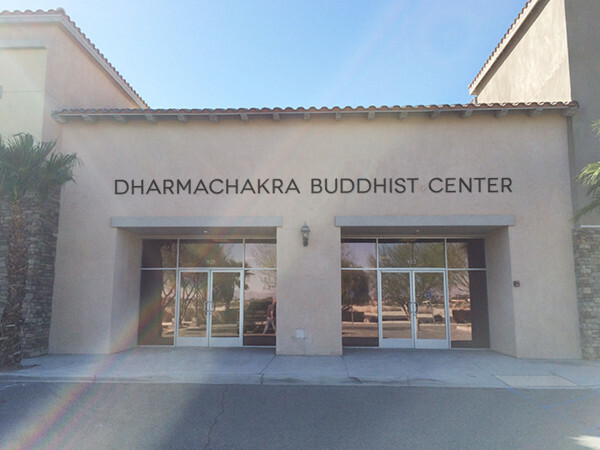 We are now more centrally located to serve the people of Coachella Valley with teachings on Buddhism and Meditation. As part of the celebration of this development our National Spiritual Director Gen Kelsang Rigpa will guide a special blessing ceremony and present an inspiring teaching for the opening of our new space. Registration: Space is limited, pre-registration is required and is open now. This event is free ~ Donations are being accepted to help cover the costs of this event as well as remaining costs for our new space. Dharmachakra Buddhist Center is a non-profit organization. We are still in need of donations to help facilitate the costs associated with our new space. These include $2000 for a new outdoor sign, $900 for a sound system, $600 for educational displays, $400 to paint our beautiful Vajradhara statue, $1000 for electrical work, and $500 for bathroom renovations. If you are able to give any amount towards these projects your generosity is very much appreciated. To make a donation click here. Or if you are attending the opening with Gen Rigpa you can make a donation when you register. The California Dharma Celebration at KMC-Hollywood begins this Friday evening. This is a wonderful opportunity to receive profound teachings from National Spiritual Director Gen Kelsang Rigpa and to meet the Southern California Sangha and. If you have not already registered please do so here: cadharmacelebration.org – See you there! This empowerment is a beautiful guided meditation during which we will receive the blessings of Medicine Buddha, the embodiment of all enlightened healing energy. More Information. The purpose of these classes is to gain personal experience of inner peace through the practice of meditation. This month we will focus on meditations to develop a kind heart as well as learn a profound healing meditation. You can like us on Facebook or check out our website at meditationinpalmsprings.org.